The Philips Saeco Royal One Touch Cappuccino Automatic Espresso Machine lets you customize your espresso settings using a simple interface, so you can brew your perfect beverage with a single touch. 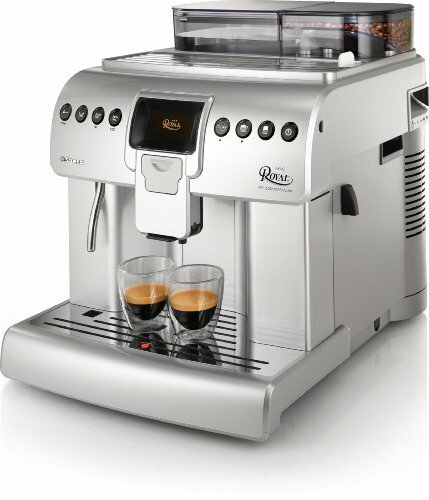 The machine includes a cup-warming surface, Cappucinatore, and double boiler for simultaneous brewing and milk steaming. Offers solid performance and the generous tanks for beans, water, and coffee grounds. View larger. Whether you want to drink a cappuccino or an espresso, the direct beverage selection allows you to enjoy your favorite coffee at the touch of a button. 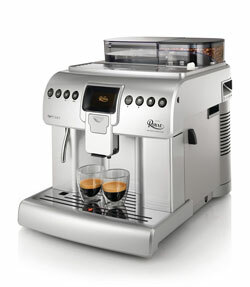 The Royal's independent circuits ensure the coffee is prepared quickly and conveniently right after the milk is frothed. It's simple to customize your coffee beverage. Just select your favorite kind of coffee, set the fill capacity, and choose the intensity, which includes the temperature, pre-brewing, and strength. Fill capacity: Decide how much coffee to brew based on your preferences and/or the size of your cups. Temperature: Set the temperature for your coffee using the menu settings on your machine. Pre-brewing: Use the menu settings to specify how long the instant coffee should be moistened in the infusion chamber before brewing in order to develop its full flavor. Strength: Adjust the strength of your coffee with the machine's special lever, which allows you to measure the exact amount of coffee beans to be ground. An integrated Cappucinatore makes foamy milk preparation easy and automatic. The container automatically dispenses your preferred amount of frothed milk directly into your cup during the brewing process. The Cappucinatore is dishwasher safe. Enjoy a fresh cup of coffee each time you brew. The machine automatically cleans the coffee circuit whenever it goes into or comes out of standby mode. Conveniently store cups and glasses right on the machine and warm them up before use. Warming the cup helps develop the flavor of your coffee and keeps crema firm. The machine uses heat from the boiler to warm cups, adding to the machine's efficient operation. The Royal One Touch offers easy front access to all compartments, whether you're adding coffee beans and water or emptying the coffee grounds container and drip tray. All Philips Saeco machines are tested with coffee. Although they have been carefully cleaned, there might be some coffee residue in the machine. However, the machine is absolutely new, and it is recommended that you read the instructions before use. The Philips Saeco Royal One Touch is backed by a limited one-year warranty. Philips Saeco Royal One Touch Cappuccino Automatic Espresso Machine, removable water tank, water filter, Cappuccinatore, cleaning brush, measuring scoop for pre-ground coffee, brew group cleaning tablets, descaling solution, milk circuit detergent, and instructions.